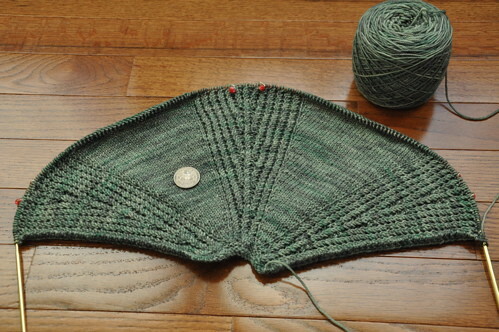 Next time Hubby’s out of town for business, I want to work on a sleeve for my Eris cardigan. I’m ditching the pattern sleeve because I don’t want it to be floppy and I need to do some calculating for the decreases and cuff. Happily I have the whole body as a swatch for row and stitch gauge. I’ve loved the DNA scarf pattern for years, I’ve been wanting a Seaman’s Scarf, and I have the perfect Lorna’s Laces Shepherd Sport yarn for it, in a slightly variegated satsuma colour. I must knit bright colours in winter. These need a heel and a cuff on the second sock, and I’ll have a pair of blood red socks. It won’t take long once I get past the complicated part. These will go through the washer and dryer, I need them to shrink a little. This may be a long term project. There’s a 12 row repeat and I have 900yds of sock yarn to get through. I like the pattern a lot, it’s a shawl with no lace, just columns of twisted stitches and two plain panels that show off the yarn. Four repeats done so far. I’m blaming Laura for this, she turned up at knitting morning with an amazing tatted lace flower, and made a lace ring while we watched. There’s an article with an instruction video, all you need is crochet cotton and a standard (preferably blunt) needle. I’m not fond of needle tatting, but I absolutely adore traditional tatting. I learned it when I was 16 and have made many, many lace-edged hankies. You can get a cheap shuttle (all you need) at any of the craft stores if you want to try that! I definitely emphasize the “blunt” in “blunt needle.” My proper tatting needle is still on order from roseground.com, and I keep stabbing myself on the regular pointy needle!